A friend of mine is visiting Western Washington with her dog this summer for 3 weeks. She sent me her extensive list of dog friendly hikes on her agenda and there were a few that I haven’t done. While I’m saving most of them for her visit, I decided to knock one off our bucket list now – the Diablo Lake Trail. 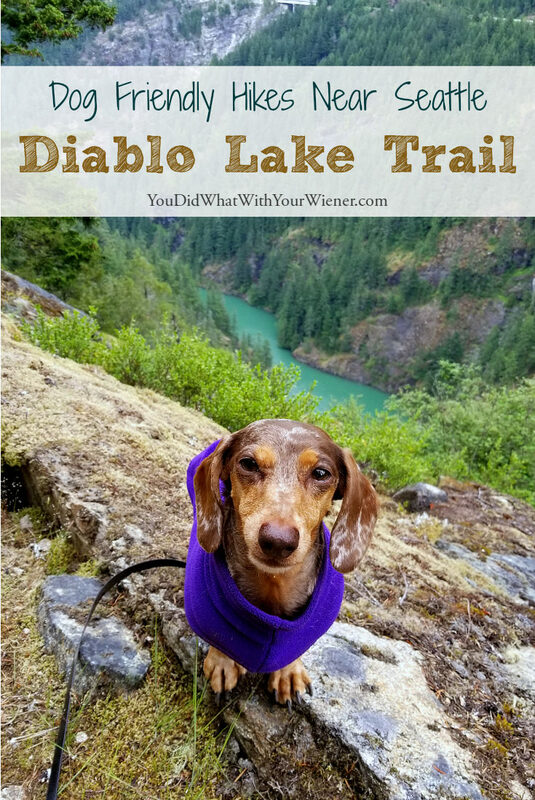 It’s one of the few hiking trails that allows dogs in North Cascades National Park (it’s actually in the adjacent Ross Lake National Recreation Area managed by the park but more on that later). Since the Diablo Lake Trail is a 2.5 – 3.5 hour drive from Seattle (depending on traffic), Gretel and I headed up late the night before to camp. We pulled into the Gorge Creek Campground a little after 10 pm and slept in the car (a dog and camping friendly Toyota 4Runner). We got up early the next morning to get going. Once we found the trail, we started out on the gentle incline through the forest. The trail crossed a small dirt road, and passed the North Cascades Environmental Learning Center. Things didn’t start to get good until past that point. We entered into a lush, green forest with plentiful ferns, Oregon Grape, and many other plants starting to peek out for the spring. 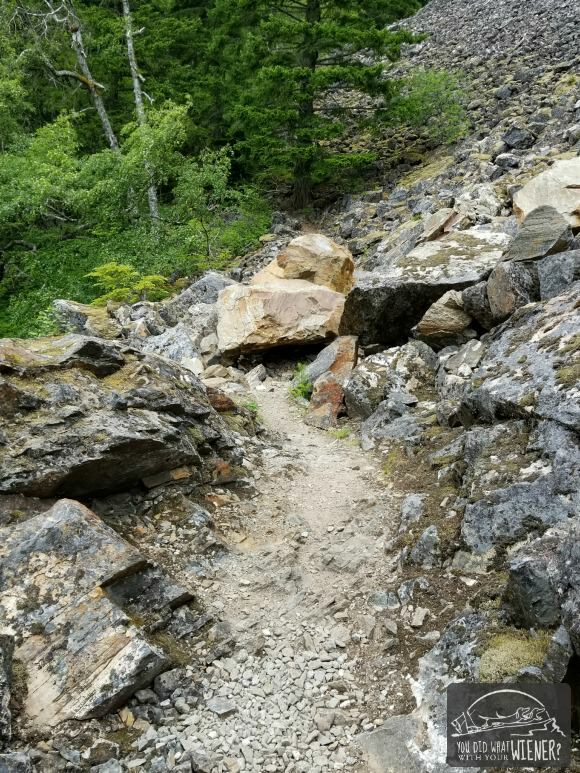 The hike description I read mentioned crossing a rock slide, or avalanche chute, or rocky area… I didn’t pay much attention because that’s not unusual on northwest trails. It made the hike a bit comical though. I first came to a dry stream bed. At one point, the stream washed a lot of rock and gravel down the mountain. I thought, “this must be what they were talking about”. It was a bit hard to see the trail upon first glance but once I got closer it was very clear. Then I came to another rock slide area and thought, “Oh, THIS must be what they were talking about”. Nope, because there was a third one that looked pretty fresh and had some pretty big boulders. I think THAT’S what they were talking about. Most of the hike was interesting because of the rock slides, green vegetation, and wildflowers but I was super excited when we popped out of the woods and could see Diablo Lake below. It’s such a spectacular blue because of the glacial till. I never get tired of that color. The day was cloudy but I could see some of the mountains. I can image the views being better when it’s clear. We stopped at the lookout for Ross Dam. There was rushing water cascade (not sure it qualifies as a waterfall?) to the left. I could see part of it through the trees, and could hear the crashing water, so I was super curious. However, the side trail to get there was partly washed out and didn’t look well-traveled. I decided not to push it since Gretel and I were hiking alone and, instead, we turned around and headed down the hill to the bridge. The bridge experience was interesting. Although it’s a suspension bridge, it’s big and looks pretty stable. However, the wind picked up when we got to the middle and it started to move. Gretel was like “OMG, pick me up Ma we’re going to fall”. Ha, ha. I actually started to feel a little “sea sick”. I think it was something to see once but we headed back into the woods quickly. The hike back was pretty uneventful but was almost a mile and a half longer than I thought it would be. We were definitely glad to see the car again. The adventure wasn’t over though. When I put Gretel into her car seat, she immediately started to lick the inside of her leg. I didn’t think a whole lot of it but she did it again shortly after. I took note but was not concerned… until she did it again. I pulled over to see what was going on and she had a little black spot on her leg. I ran my finger over it and didn’t feel like anything so I thought maybe it was a spot of dirt or oil. But I got closer and guess what? It was a tick! It looked like it has just bitten her 🙁 Luckily, I had my first aid kit in the car and dug out the tweezers. That bugger was really holding on so it took me a few attempts but I managed to pull it out with the head still in-tact. I put it in a little vial (also in my first aid kit) to show the vet if I need to take her in. That’s only the 3rd tick I’ve seen in my life – one on a tent and one that bit Chester a couple of years ago. Based on my experience with Chester at the vet, I am not panicking about tick-borne diseases but I am keeping an eye on her for signs that she doesn’t feel well. Note: Dogs are not allowed in within North Cascades National Park except on a leash on the Pacific Crest Trail, and within 50 feet of roads. 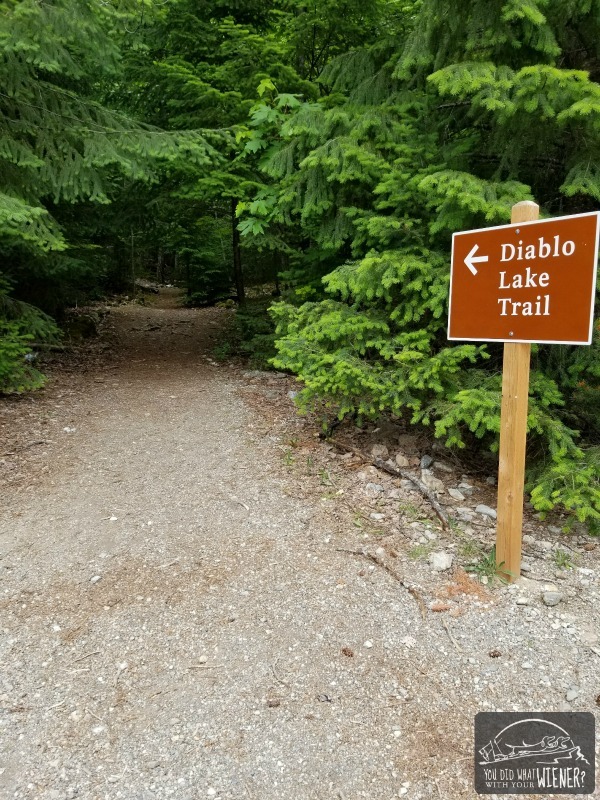 The Diablo Lake trail looks like it’s located within the park on some maps but it is actually in the Ross Lake National Recreation Area adjacent to the park boundary. The recreation area is managed by the national park but has different regulations. Dogs ARE allowed on the trails within the recreation area. However, if the trail leads into the National Park, you must stop at the park boundary with your dog. It took us a while to find the trailhead. The trails in the area are not super popular and the trailheads are pretty rustic (like random sign near a mossy rock kind of rustic). Google Maps showed that we could drive through the tiny town of Diablo to get there but we hit a dead-end and had to backtrack a short way to the highway. Even once we turned off and crossed the dam on the one-lane road, it was a bit hard to spot exactly where the trail started. Parking for the trail is shared with the North Cascades Environmental Learning Center (NCELC). There are two small lots and one was closed so we were lucky to be able to squeeze into one of the last spots (the other lot was under construction). I parked and got out to look around. I found the sign for the trail on the opposite side of the road, just before the NCELC gate. We hit the trail around 9 am on a Monday. We hardly saw anyone else most of the way. We did run into a few hikers on our way out but didn’t see anyone hiking with a dog. I can’t say how busy this trail is on the weekends but I would be surprised if it’s as crowded as many of the trails closer to Seattle. Still, if you want a better chance of having the place to yourself, go early on a weekday. There are a few trail junctions in the beginning. Most of them are pretty clear. However, the last junction had a wooden post but no sign. It looked like there was a trail that dropped down to the right but we stayed left. It was the right choice. Most of the trail is in the woods. There are some moist, green sections with lots of plants and ferns in the beginning. The rest of the trail is through a more arid, dry forest. There are several creeks to cross and most of them had stepping stones or logs for crossing. Since we visited in spring when snowmelt is high, and they were easy to cross, I can’t imagine them being an issue other times of the year. As far as obstacles, there are several rocky areas to cross. Only one was a challenge at all but it was still pretty easy for me to navigate. However, it was a bit tricky for Gretel because of one big drop (maybe 2 feet) and a little place she would have to squeeze through two boulders (it was barely wide enough for her). I carried her over that short part. There are also a few trees across the trail once you start heading down to the dam (and I think one before the dam lookout). It was easy for me to step over them. Gretel either jumped over them or went under. At about 2.5 miles, you start to get a few views of the lake and surrounding mountains. In about another mile, you head back into the woods. I thought hiking the whole trail was worthwhile but I’ve heard some people complain they thought the trail after that section was a letdown. If you are looking for a shorter hike, a good turnaround point is when you clearly see the lake below or after the lookout by the power lines (where power lines cross the trail). 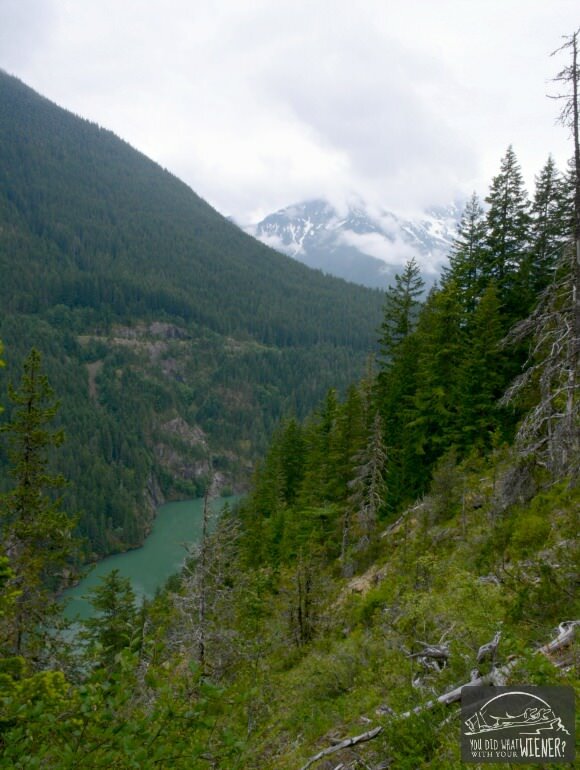 This trail skirts along the hillside behind Diablo Lake, which you can see from Highway 20. Somewhat unfortunately, that means that you see an hear Highway 20 for a significant portion of the hike. Also, the trail ends at a dam, which you hear loudly starting about 3/4 mile from it. However, I honestly didn’t feel like those things detracted from the experience much. The Washington Trails Association lists this trail as being 7.6 miles long. That figure would be fairly accurate if you only go to the lookout for the dam. It was about another half mile (1 mile round trip) to go down to the bridge crossing the lake. My GPS said we hiked 9 miles once we got back to the car, which included a hike down to the bridge and two stops at the lookout by the power lines (it’s a short side-trail). Ticks aren’t generally common on the west side of the Cascade Mountains but I can’t speak specifically for the North Cascades National Park area. Just be aware that they are there. Distance: 7.6 miles round trip to the dam lookout, closer to 9 if you go down to the bridge. Directions: Drive north from Seattle, or south from Bellingham, on I-5 and take the exit for Highway SR 20 – North Cascades Highway (Exit 230). Drive east on the North Cascades Highway for 20 miles to the Gorge Lake Bridge. Cross the bridge, and continue for another 1.5 miles, then turn left onto Diablo Dam Road. The road will be signed for the North Cascades Environmental Learning Center. Stay on the road and cross the dam, and in a little more than a mile you will arrive at the end of the road and the trailhead. The parking area is shared with the North Cascades Environmental Learning Center. 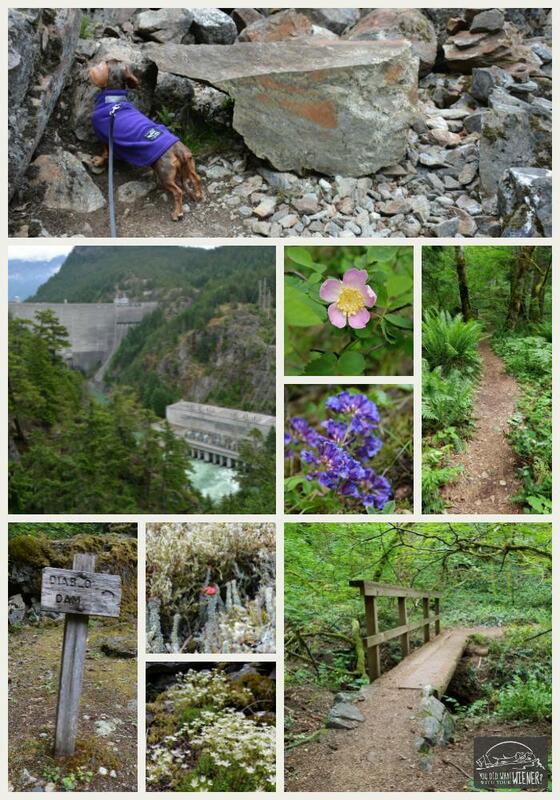 For more information check out the Washington Trails Association Diablo Lake Trail hike description. You are lucky, here in New England you can’t walk 2 feet without a tick grabbing on to you. We have been sticking to walks on the beaches as much as possible. I know how bad it is there. It’s almost that bad in some areas of Eastern Washington. Yuck! Wow, Gretel is a very sensitive girl. I’ve never had a dog show any signs of noticing a tick bite. Glad you were paying attention. Well, it was very near a *ahem* very sensitive area on the inside of her leg… if you get my drift 😉 I’m super glad she did feel it and I caught it early. I’m doing more research but I’ve read several articles said that a tick needs to be attached for at least 24 hours to transmit Lyme Disease. Do you know anything about that? I recently saw an article on FB stating that there is no research showing that the 24 hour thing may be false for some of the many tick-borne diseases. Sorry I couldn’t find it again. And I don’t remember specifically what it said about Lyme. But it might be a good question to ask your vet since she is probably getting the latest information on the topic. It sounds like a beautiful hike. I’m glad Gretel noticed that tick bite right away! The ticks are terrible here, so as soon as she licked her leg, I thought…tick! If we had been in an area that is well known for having ticks, I would have assumed that too. We just don’t have many on the west side of the mountains so I’m really just starting to learn about prevention and treatment. I’m super glad I caught it early. Myrtle Beach?! I wouldn’t have thought they had ticks there. Glad your Dad spotted it. I’m so jealous of all of your amazing adventures. The views are always so picturesque! It’s pretty hard to take a bad picture around here. Ha, ha. I didn’t realize there were dog-friendly hikes in that area! I loved Mazama and those little floating cabins at Ross Lake are on my bucket list! There are! Many. I’m getting ready to write a blog post that will highlight a few in the area.